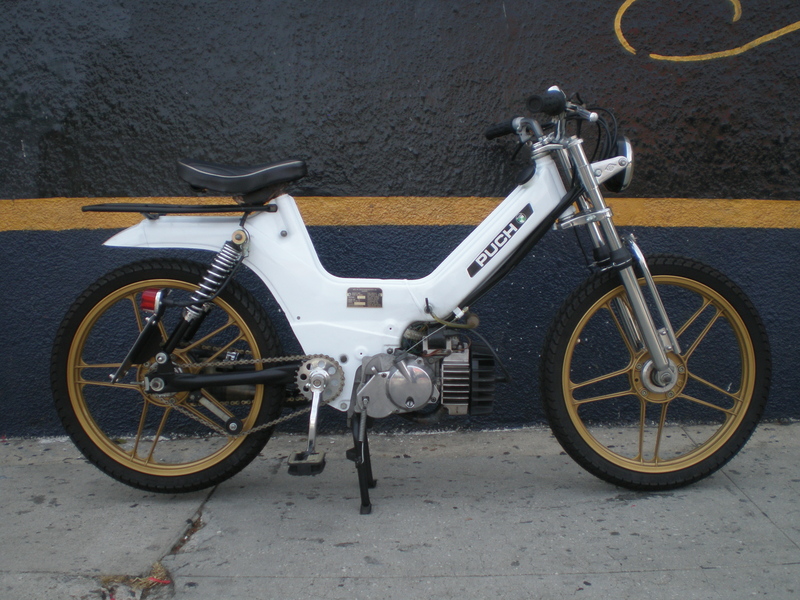 Here is an electric bike made from the frame of a Puch Maxi moped. The builder is a young man named Bernd, who lives in Korneuburg (near Vienna), in the beautiful country of Austria. Although a moped frame is an unconventional choice, this frame style allowed Bernd (endless-sphere member puchwudi) to hide the significant battery pack inside the frame. In Europe, mopeds are very common. A moped is differentiated from a scooter in several ways, the most obvious being that they have pedals. Moped laws vary by country, but…generally speaking, the legal definition of a moped is that it must have fully functional pedals, the engine has less than 2 horsepower (1500 watts), in a displacement that cannot exceed 50cc (3.1 cu in), and its top speed is limited to 30 miles per hour (48-km/h). According to California law, moped registration is only $16 for life, which makes them very affordable to use. The main frame section of the Puch Maxi moped. In the pic above, this main frame version is actually shown after several attempts at a build-up. Here, it has had a steel pipe welded-in to form a top-tube, which strengthens the frame in a well-known way used by moped hot-rodders. The hollow down-tube section is normally used as the fuel tank, and will now house batteries. A custom side-cover made from steel. Bernd wanted a large and powerful hubmotor, and although the motor itself would not be very stealthy, by doing that he hoped to retain the maximum amount of frame space for an internal battery pack, compared to mounting a non-hub motor in the frame. The hub he chose is from the Quan Shun electric scooter company. QS also makes hubmotors in several sizes even larger than this, but…this is the largest hubbie that we recommend for an electric bike, since it easily avoids getting hot when fed 7000W, and yet it is still small enough to use a one-cross pattern when laced to a 16-inch moped rim. The front rim is a 17 X 1.2-inch, and the rear is a 17 X 1.8, both with Sawa sport tires. Rear spokes are 4mm thick. Using wood to measure out the custom swingarm. Don’t laugh because he used wood to determine the swingarm length! I have also done rapid prototyping with wood, and doing that is cheap, easy, and fast. The raw aluminum tubing used for the swingarms, plus the custom-machined front pivot bearing holders. The drop-outs are a straight-slot “track” style. Due to the expected high power of the motor he chose, he added a clamping element to the drop-out ends. I like the drop-outs very much! The initial assembly revealed a significant offset to the hub and rim relationship. He chose to add some opposing offset to the left side of the swingarm. In the pic below, the bike is upside down. A custom bend is welded into the left side of the swingarm. For braking force, the rear wheel doesn’t need a very large diameter disc to apply adequate braking (when braking, most of any bikes’ weight shifts to the front brake). A new trend I am seeing more often these days is a large-diameter rear disc being used, so that the caliper can be moved farther away from the axle, since hubmotors are fatter near the axle, and narrower near the motor edge. Here you can see the Forsa rear shock, and the entire rear assembly taking shape. Bernd fabricated rolling chainguides from scratch. The replaceable rollers are plastic, and they are spun on bearings. Here you can see the unusual chainline and the custom chain-guides. Once the final shapes are cut and filed, it is important to coat the shapes with some type of wax, so the epoxy doesn’t stick to the styrofoam after it’s dried. Applying the epoxy onto the cloth with a disposable brush and gloves. Bernd applied three layers of fiberglass, which ended up with a 4mm thick wall (probably more than necessary). The first two layers were loose fibers, and the last layer was a cloth. The molds were glued to a plank, then loose fibers and epoxy applied, then a second layer, then cloth and epoxy. Here, they have cured into hard shells. If you coated the mold cores with wax at the beginning, the styrofoam will be fairly easy to remove at this point. Once the fairing was cut away from the plank, he used a Dremel to cut slots near the edges so velcro straps could hold it onto the suspension fork stanchions. A large LED light that was cannibalized from a head-mounted “hands free” unit. Its a small styling touch, but I feel it really adds something special. One of the features of the “Sondors” fatbike that really appealed to a large portion of their polled customers was the triangle-shaped hard case in the center of the frame. It not only held the battery pack, it also hid the controller and the wiring clutter that normally makes DIY ebikes look less professional. Of course, there are so many frames with hundreds of minor variations, that acquiring a perfectly-fitting set of panels is only possible if you make them yourself. You can do it, so I want to start seeing more custom hard panels on those home-built ebikes! A pack made from Headway cells. Figuring out how many of the 18650-format cells can fit inside the hollow frame. Using 22S / 8P = 176 cells. The camera snapped at exactly the moment that the spot-welding probes were energized! If the idea of spot-welding 18650 cells together to make a custom battery appeals to you, here is our story of an ebike builder who did that. Adding thick copper wire to the nickel strips to make high current flow easier with less resistance. The pure nickel “spot welded” strips are 0.20mm thick. Adding balance wires to the sub-pack. Here are the five sub-packs after the wires have all been properly attached, and heat shrink was installed around them to add extra chafing protection. Padding being added to the inside of the frame. In the pic above, insulative padding is being glued into the inside of the hollow frame to add an extra layer of protection. You can also see “spiral wrap” that was added around the cables to help protect them too. Once Bernd was satisfied the frame and battery packs, he dis-assembled everything to get all the parts off to be painted. Bernd chose a very bold shade of green, I like it! In front of the downtube, he mounted an 18-FET controller. It was an EB318 Xie Chang unit from Lyen, which has a programmable chip that was modeled after the Infineon. Adding a charge socket and ignition switch to the right-side removable panel. The BMS, a circuit-board that performs electric bicycle voodoo. BMS’s often limit the charging amperage, and also can be programmed to limit the output current. Some even have built-in heat protection, and a digital voltage read-out. The BMS has been mounted inside the right side panel, next to the ignition switch and charge port. An electric 5V throttle from Domino. Moving right along! The masking tape protects the new paint while other assembly problems are sorted. Austria has cold winters, and that leads to indoor projects! Here is a pic of the wooden stand he built to hold the frame at chest height, to make it easier to sort out the wiring. Getting to the forks on means the end is getting close! The front suspension will be a Marzocchi 888 VF2, with a 20mm diameter through-axle. No chain yet, but the assembly is very close to finished, and the weather was nice, so…sometimes you have to get good pics whenever you can! In this pic, it’s hard to believe that he has 81V X 20-Ah = 1620 watt-hours of power hidden inside it! Maximum speed on flat ground is 85-km/h (53-MPH). If you want to see more of the pictures from the build process, you can view the discussion thread here. Cool ride! Well done! Respect! so the original moped body didnt need a top bar, did you need to put it on for of road strength? pity, it looked much cleaner without it. Great Article. discussion ! I was enlightened by the info – Does someone know where my assistant could find a blank CA SUBP-001 example to fill out ?